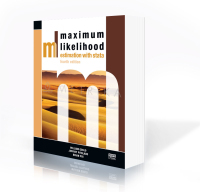 Maximum Likelihood Estimation with Stata, Fourth Edition is the essential reference and guide for researchers in all disciplines who wish to write maximum likelihood (ML) estimators in Stata. Beyond providing comprehensive coverage of Stata’s ml command for writing ML estimators, the book presents an overview of the underpinnings of maximum likelihood and how to think about ML estimation. When appropriate options are used, many of these features are provided automatically by ml and require no special programming or intervention by the researcher writing the estimator. The fourth edition has been updated to include new features introduced in recent versions of Stata. Such features include new methods for handling scores, more consistent arguments for likelihood-evaluator programs, and support for likelihood evaluators written in Mata (Stata’s matrix programming language). The authors illustrate how to write your estimation command so that it fully supports factor-variable notation and the svy prefix for estimation with survey data. They have also restructured the chapters that introduceml in a way that allows you to begin working with ml faster. This edition is essential for anyone using Stata 11. In the final chapter, the authors illustrate the major steps required to get from log-likelihood function to fully operational estimation command. This is done using several different models: logit and probit, linear regression, Weibull regression, the Cox proportional hazards model, random-effects regression, and seemingly unrelated regression. The authors provide extensive advice for developing your own estimation commands. With a little care and the help of this book, users will be able to write their own estimation commands—commands that look and behave just like the official estimation commands in Stata. Whether you want to fit a special ML estimator for your own research or wish to write a general-purpose ML estimator for others to use, you need this book.